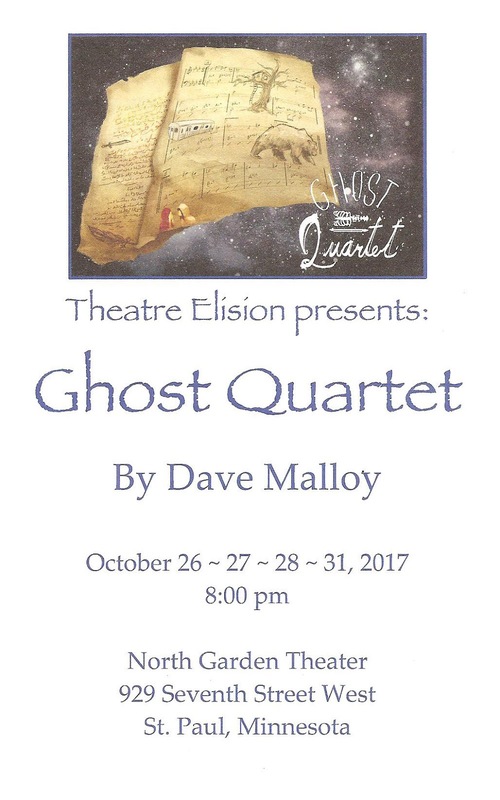 Just in time for Halloween, Theatre Elision brings us Ghost Quartet, by Dave Malloy, the composer/lyricist of Natasha, Pierre, and the Great Comet of 1812 (which recently closed too soon on Broadway). In their third show as a new company, Theatre Elision brings us their usual small cast and musically beautiful production, but very much in the style of Great Comet. Meaning, an intimate in-the-round setting (which Great Comet replicated on Broadway by having audience sit on stage), a fun and playful style, and with audience participation (and vodka!). It's a fantastic show that fits in well with Elision's niche of small cast, feminist, one-act, original or rarely produced musicals. And it's a perfect show for this Halloweekend! Unlike Great Comet, Ghost Quartet doesn't have a lot of complicated Russian plot and characters to get in the way of the music. Rather, it's a song cycle, about ghosts and the supernatural, with a few recurring characters. Primarily two sisters named Rose and Roxy. Or Pearl. Or maybe they're mother/daughter, or daughter/mother, or lovers. Regardless, Ghost Quartet is two dozen or so really great songs in different styles, with little dialogue in between. Some of the dialogue is to introduce each song, some to tell a story or set the scene. Each song is an independent little story of its own, but all combine together to create a larger exploration of the theme. This was my first time at the newly opened North Garden Theatre in St. Paul's West 7th neighborhood. It's a cool space that doesn't look like a theater, rather a big open room with original brick and structure of the building exposed. For this show, the performance space is set up as a circle in the center of the room, bound by the performers' stations in the four corners with musical instruments galore (and whiskey!). Seating is at tables around the circle, and chairs beyond that. In the center of the circle is a lone armchair on area rugs, and performers sit at their stations or wander through the center as they perform. The staging is innovative and interesting, and the sound is fantastic in that space. Performers sometimes use the mic stands at their stations, but often also sing with no amplification, and the space provides for a really beautiful sound quality. The other thing that provides for a really beautiful sound quality is this cast, along with music director Harrison Wade on keyboard. 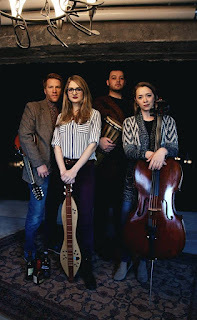 The quartet consists of Anna Baker, Tim Beeckman-Davis, Ryan Lee, and Christine Wade (also credited as vocal director), and they all have terrific voices, especially the women, whose sister/mother/daughter/lover duets are stunning. They're all wonderful performers as well, taking on a new character for each piece, and being playful with each other (often calling each other by name) and the audience. This includes serving whiskey (to those who have chosen to imbibe) and handing out percussive instruments, which makes for a fun community sort of feel (and a powerful ending). Oh, and did I mention that everyone in the cast plays multiple instruments too? Such talent! Only three performances remain of this ghostly, beautiful, and captivating Ghost Quartet - Friday, Saturday, and Tuesday (Halloween) evenings. Act fast to catch this ghost before it disappears!